The Dollhouse, is a tiny, non-profit, experimental gallery based in Noord Holland, hosting work by Dutch & International artists. Hoera!! The Dollhouse - The Dollhouse is geslaagd! Dankzij 26 donaties die samen € 4.250 opleverden voor The Dollhouse. The Dollhouse is a tiny, non-profit, experimental gallery based in Noord Holland: A small space housing big ideas! Our campaign focuses on raising funds to help launch The Dollhouse gallery, specifically, to cover the costs for the four artists in the first exhibition and costs of the first public Open (doll)House Day in September 2018. Your donation will go a long way toward making this happen! Onze campagne richt zich op het verzamelen van fondsen om The Dollhouse-galerie te lanceren, met name om de kosten voor de vier kunstenaars in de eerste tentoonstelling en de kosten van de eerste openbare Open doll(House) Dag te dekken. (september 2018). Uw donatie gaat een heel eind in de richting van het realiseren hiervan! The Dollhouse, (built in 1974 by the Dutch toy-firm G. Okkerse) is a tiny, non-profit, experimental gallery based in Noord-Holland. Hosting both Dutch and International artists and curators, The Dollhouse encourages its occupants to think BIG and make small, testing the role of scale, value, materiality and virtual worth in the art world today. Our campaign focuses on raising funds to help launch The Dollhouse gallery, specifically, to cover the costs for the four artists in the first exhibition and costs of the first public Open (doll)House Day. A small gallery housing BIG ideas, The Dollhouse calls on its artists to take on the challenges of interpreting a tiny, quasi-domestic space, (as the Tate Modern’s Turbine Hall does the gigantic, industrial space), in ways that will inspire wonder and change how we think about and view art in the twenty-first century. Thank you! Your donation will help make this happen! 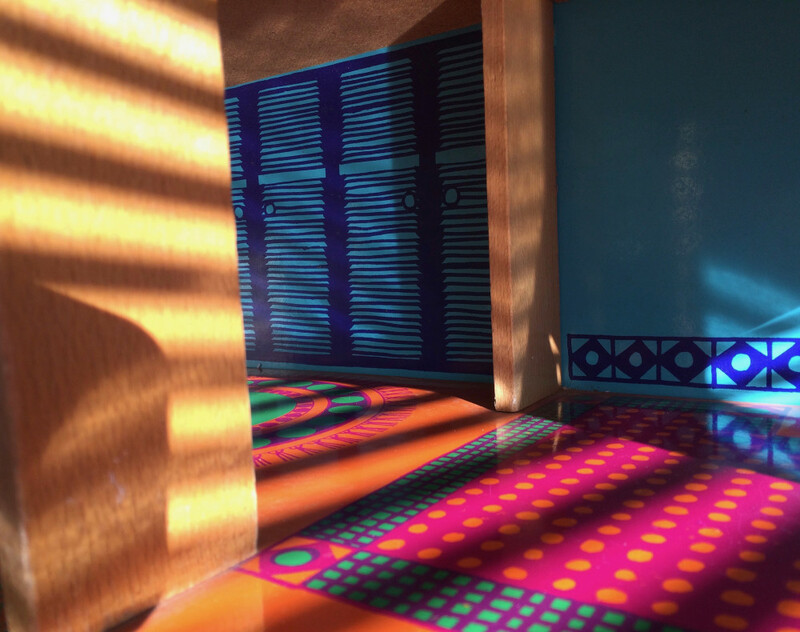 The Dollhouse: ground-floor, afternoon light. The Dollhouse, (gemaakt in 1974 door speelgoed firma G. Okkerse) is een kleine, non-profit, experimentele galerie gevestigd in Noord-Holland. The Dollhouse nodigt kunstenaars en curatoren uit zowel Nederland als het buitenland uit om GROOT te denken en klein te maken, en hierdoor ideeën over de rol van schaal, waarde, materialiteit en virtuele waarde op de proef te stellen. De geringe ruimte van The Dollhouse huisvest GROTE ideeën. De galerie daagt kunstenaars uit te werken binnen de limitaties van een kleinschalige, quasi-huiselijke ruimte (net zoals de Turbine Hall van Tate Modern dat doet voor grootse industriële ruimte), en werk te produceren dat verwondering wekt en verandering brengt in hoe wij in de 21e eeuw over kunst denken en naar kunst kijken. Hartelijk dank! Uw bijdrage helpt ons deze plannen te verwezelijken. Kunst is noodzaak voor de totale ontwikkeling van de mensheid! Heartfelt thanks from The Dollhouse! You did it! Together you pushed that slider to 100% and brought confetti raining down on The Dollhouse campaign! Thanks to your support, plans for The Dollhouse launch and opening exhibition can now proceed. I will be personally in touch with you very soon regarding your gifts and promise to keep you updated on The Dollhouse's progress. To those of you able to attend, I look forward to welcoming you to the launch of The Dollhouse in September 2018. Campaign earns a 10 day extension! Dear friends and supporters of The Dollhouse, owing to our good (but not quite good enough!) performance to date, The Dollhouse campaign has earned itself a 10 day extension! Dear Friends and supporters of The Dollhouse campaign, thank you so very much for your generous donations! Thank you for believing in art's potential and possibilities. As The Dollhouse campaign has just 4 days left to run, we've recruited the talented, straight-singing, "Dr. Teeth" to spread the message and, hopefully, help us hit that target!!! I like the scale and intimacy of the project and I am looking forward to seeing how the artists and curators respond. Ciara, you have so much passion & enthusiasm for this project. I hope you reach your crowdfunding target & your project is a big success. Super! In return for your kindness we offer you a digital 3D post-card and personalised virtual guided tour of the opening exhibition at The Dollhouse. Thank you for helping us get closer to our goal! You will receive a digital 3D post-card of The Dollhouse. Fantastic! We will send you a digital 3D post-card and invite you for a personalised REAL guided tour of the opening exhibition at The Dollhouse. Thank you ever so much! You will receive a specially commissioned, framed exhibition photograph of The Dollhouse. Splendid! Thank you! The DH director will accompany you on a "3D Selfie" photo-shoot in Haarlem, after which you will receive a 10cm 3D mini-you.